If you are the proud owner of a military surplus or old Army tent then you probably have it safely stored away in your garage, attic, or shed right now, patiently waiting until the warmth of Spring prompts you to endeavor out on a military surplus tent adventure with friends and family. But the fact of the matter is that your tent was actually made to be used in the winter just as much as it was made to be used in fair weather. Actually it was these tents that saw our forefathers through during the wars that we as a country have fought over the last few hundred years. Especially in the arenas of World War Two, as the Allies marched across war torn and mostly conquered Europe to Berlin; and in Korea where we held fast against the spread of Communism to the south, these habitats of coarse canvas fabric and wooden poles have held fast against the environment even as our soldiers held fast against tyranny and threat to the American Way. Though they are not the most insulated of materials, these tents are very mobile, and they are not bad when it comes to insulating properties, (for example, they are much better insulation than intertwined twigs and sticks for instance). So, here are three things you can do to better use your tent for winter camping. 1. Use insulation. One of the best insulators to be found during the winter time is snow. 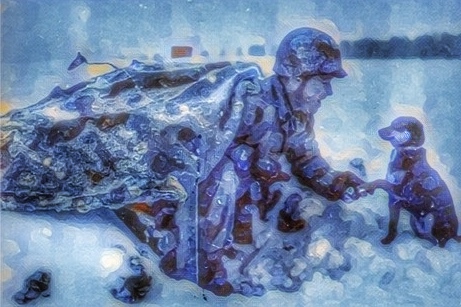 If you look at WWII camps, especially in the bitter cold, (such as the Battle of the Bulge), you will see that American soldiers often buried their tents in the snow so as to benefit from the insulation that it affords. 2. Put a heat source in it. Many military surplus tents have holes built into them to keep them warm. No concept of how a hole can keep your tent warm? Well, one way is to stick a chimney out of it. You can purchase, or make inexpensive woodstoves to go into your military surplus tent and make a chimney out of stovepipe. This will bring unparalleled warmth to your winter camp that will in ways, make it better than camping in other seasons. 3. Sleep off the ground. In the winter, especially in the bitter cold, a ground cloth will do nothing but create another way for the cold earth to leech the life out of you. Your very best bet is to invest in a cot of some sort to keep some dead air space between your body and the cold cold ground.